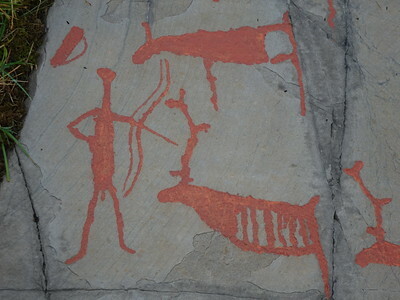 The Rock Art of Alta consists of more than 6,000 prehistoric rock carvings and paintings on five separate sites along Altafjord. The rock art was discovered between 1966 and 1978. The main site Hjemmeluft contains around 3000 individual carvings and has been turned into an open-air museum. The earliest carvings in the area date from around 5,000 BC; the most recent carvings are some 2,000 years old. The wide variety of imagery shows a culture of hunter-gatherers that was able to control herds of reindeer, was adept at boat building and fishing and practiced shamanistic rituals involving bear worship and other venerated animals. The city of Alta is the highest up north that I have ever been – 80km closer to the North Pole than my previous record, Greenland’s Ilulissat. I had come just for the day to see its Rock Art – fly in on Friday evening, fly out Sunday morning. I made a half-hearted attempt of visiting Lille Raipas as well, one of the Struve sites on a hill just 5km out of town. But it rained for most of my stay in Alta so hiking was out of the question. Alta’s Rock Art - consisting of 4 locations with carvings and 1 with paintings - has been ‘discovered’ relatively recently. 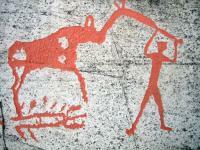 In 1966 the rock paintings were found at Transfarelvdalen, the rock carvings followed between 1973 and 1978. The sites were inscribed on the World Heritage List only 7 years later – it makes one wonder why so quickly, before the dust had settled so to speak. Much more carvings in the same areas have been discovered since. Conservation practices in this harsh landscape have also evolved a lot: they now regularly ‘clean’ the rocks with alcohol to avoid overgrowth of them by lichen (they apparently did not do that yet in 1987, when Solivagant visited). There wasn’t a management plan until the year 2000, sites those days got in because of a certain Wow-factor I guess. 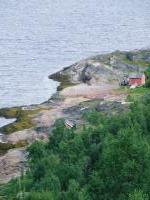 Only the site at Hjemmeluft is open to tourists, that's where also the Alta Museum is located. Here I paid the 115 NOK entrance fee plus an extra 25 NOK for a good audio guide. You also receive a comprehensive booklet explaining the site, they even had one in Dutch. I first did a quick round of the exhibition rooms at the museum building itself, but found them a bit disappointing. Moreover, the real rock art was there waiting to be explored outside. There are 2 boardwalk routes along the rock drawings: one takes 30 minutes and the other adds another 60 minutes to the shorter loop. I started going left, where the most famous of the drawings can be found. These all are still clarified by red paint – a practice that the site conservationists are now discontinuing and never even started with the more recently discovered rock art. With the paint, it’s easy to find the iconic images that are unique to Alta such as the reindeer being herded into corrals. I especially liked the drawing of a small fishing boat with a long fishing line attached, ending with an enormous halibut at the hook. The halibut is of the same size as the bear that is depicted next to it. It started raining again heavily before I even finished the shorter loop. So I went inside and sat in the museum café just to wait it out. I had nothing else to do in Alta anyway. Tour groups trickled in steadily and went again. My patience was rewarded and I could continue on the trail after 1.5 hours or so. My focus was now on the groups of rock drawings on the other side of the bay. These are mostly of a later date and therefore closer to the shore. They have been left unpainted, which made the scenes very hard to distinguish on a cloudy day. There must be an image of a skier here ("the only one in Scandinavian rock art"), but I never found it. We now have at least 42 sites with rock drawings and 37 sites with rock paintings on the WH List. And there will be no end to it: ICOMOS considers that “Rock art is the most widespread cultural manifestation of humankind” and has even developed Rock art prenomination guidelines to help future nominees. Although all Rock art may look the same to an untrained eye, it can demonstrate OUV in various ways; varying from the aesthetic quality of the art (Vézère valley), the quantity of the findings (Valcamonica), the use of special practices or rarity aspects. Alta is placed in the last category, thanks to its location. But I don’t know whether the early human activity so far north was meant, or the interaction with the landscape that made the prehistoric people of Alta use ‘clean canvases’ for their art. Whenever the sea level dropped and a fresh slate of rock was exposed yet without moss or lichen, they started covering it with Rock art. I visited this WHS in May 2010. It is quite remote, close to the Arctic Circle and still cold although there was the midnight sun when I went there. However, you'll be rewarded for your perseverance if you visit this place. The snow-capped mountains and sea form an idyllic background to the numerous rock carvings at Alta. The visitor centre is very well organised with valuable information and a much needed cup of hot chocolate after visiting the site. I enjoyed visiting the rock art with its coloring as it brought out the designs so clearly (compared to those in the Coa Valley, Portugal). The town of Alta is no WHS, but I found the surrounding landscape interesting and varied; rural Lapland with Sami villages towards Hammerfest, rocky gorges followed by tundra towards Finland, and coastal fiord scenery west to Tromso. And I found friendly Nowegians and Finns operating bus services to all these places. Within Alta there is a local bus service linking the various parts of town, but not on Sundays, so I had to walk from the Sentrum to Hjemmeluft to visit the museum and rock engravings. The town of Alta is not what-so-ever worth a detour. Spread out over 5 km with not less than three centres it could certainly pose as the Norwegian equivalent of one of those remote villages in an American road movie where the hero ends up in after having taken the wrong turn on the highway and gets tangled up in a weird story. The rock carvings on the other hand, are worth a detour! If you happen to be in the neighbourhood, start with the excellent museum, café and souvenir shop all-in-onet before you embark on a long walk pass the many carvings. Some of them are over 9000 years old and once made by the Komsa culture back in the stone- and bronze age. And there are thousands of them...boats, reindeers, bears, fish, birds, elks, women and men, children, hunting scenes in an endless row. And its all up to your own imagination what they really means and tells. No one has really managed to explain them fully. There are (at least?) 4 different WHS solely devoted to prehistoric rock carvings – Alta (Norway), Valcamonica (Italy), Tanum (Sweden) and Coa Valley (Portugal)- Bhimbetka in India I think is all rock painting rather than petroglyphs. I have been lucky enough to visit the first 3(and some others – for instance those at Cholton Ata on the Kyrgyzstan Tentative list). I am no expert on the subject (Have a look at http://rupestre.net/ for an entrée to the world of Rock art) and would not attempt to judge between them on grounds of artistic merit or historical significance – all are worth visiting but perhaps the site at Alta is the most atmospheric. The carvings overlook Alta fjord - way inside the Arctic Circle. If you have driven here from Southern Norway you have come a long long way – and it feels it. Just driving round this enormous fjord on the way to the North Cape is a half day drive! The Norwegians (as have the Swedes) have decided to highlight the carvings with a dye (the Italians have not) this makes them clear and easy to see. All are close together on a series of ice-smoothed rocks. Apparently they date from around 4200 – 500BCE. It is nice to think of ancient peoples passing the time by recording their daily lives and beliefs whilst looking out over that same fjord view which even today shows few signs of modern life apart from a few farmsteads (although the sea level was apparently somewhat different then - higher I believe because of Isostatic rebound (??) - and the rocks were therefore closer to the shore)! From "Rock Drawings of Alta" to "Rock Art of Alta"
Isostatic Rebound: The rock art is further away from the sea than when carved. 61 Community Members have visited.